What is OPNFV or Open Platform for NFV Project? Networking > NFV > NFV Definitions > What is OPNFV or Open Platform for NFV Project? In September 2014, the Linux Foundation announced another open source reference platform — the Open Platform for NFV Project (OPNFV), which aims to be a carrier-grade, integrated platform that introduces new products and services to the industry quickly. In January 2018, the governance of OPNFV moved to the LF Networking Fund, which is an entity that governs multiple projects. OPNFV will also work closely with the European Telecommunications Standards Institute (ETSI) and others to press for consistent implementation of open standards. The Linux Foundation, the non-profit known for its commitment to an open community, began the OpenDaylight Project in April 2013 to advance software-defined networking (SDN) and network functions virtualization (NFV). The project provides the SDN-based Control for OPNFV. Like OPNFV, it was created as a community-led and industry-supported open source framework. SDN and NFV together are part of the industry’s transition toward virtualization of networks and applications. OPNFV promotes an open source network that brings companies together to accelerate innovation, as well as market new technologies. OPNFV brings together service providers, cloud and infrastructure vendors, developers, and customers to create an open source platform to speed up the development and deployment of NFV for both enterprise and service provider networks. Develop an open-source platform that can be used to increase NFV functionality, bringing new products and services to the market faster. Involve top companies that use NFV so OPNFV meets the standards they will need. Contribute to and be a part of open source projects that will likely become integrated with the OPNFV platform for an overall consistency and interoperability between components. Establish an ecosystem where NFV products are based on open standards and software to meet needs. Promote OPNFV as the go-to for open source NFV. Founding members include AT&T, Brocade (which has since been bought by Broadcom while their software product was split between AT&T, Pulse Secure, and Lumina), China Mobile, Cisco, Dell, Ericsson, HP, Huawei, IBM, Intel, Juniper Networks, NEC, Nokia Networks, NTT DoCoMo, Red Hat, Telecom Italia (now TIM), and Vodafone. A current list of members to the Linux Foundation can be found here. 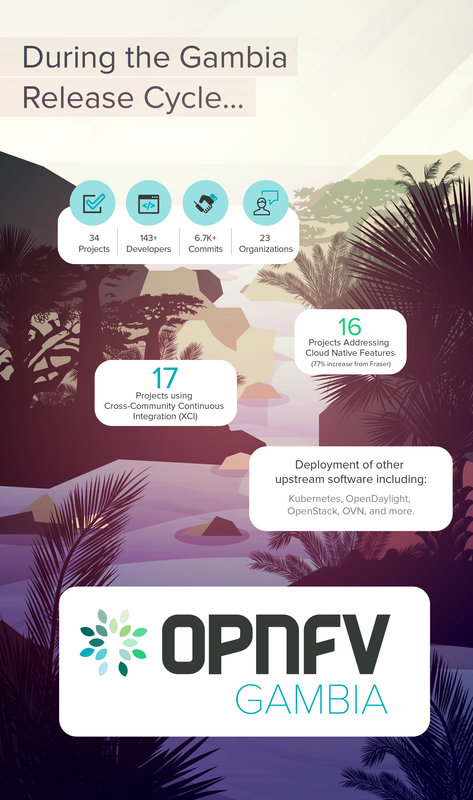 For the OPNFV Gambia release, the open source organization had over 143 developers, over 6,700 commits, and 23 contributing organizations. OPNFV licenses outbound code under the Apache License Version 2.0. It plans to produce a release every six months. Its seventh NFV integration, testing, and deployment release, named Gambia, “represents our first step towards continuous delivery (CD) and deepens our work in cloud native, while also advancing our core capabilities in testing and integration, and the development of carrier-grade features by working upstream,” according to the open source group. The use of continuous delivery of scenario and feature project artifacts containing the latest upstream code. The addition of container support to seven of the projects within Gambia, OPNFV projects that already had containers now have more cloud native functionality. The introduction of two OPNFV installers that now support deployment of a containerized version of OpenStack. The improvement of monitoring and service assurance. The integration of Gambia with upstream projects like OpenStack Queens, OpenDaylight Oxygen/Fluorine, and Kubernetes v1.11. What Are the Advantages of SD-WAN Open Source?What is a Virtual Network Function or VNF?What is an OpenDaylight Controller? AKA: OpenDaylight PlatformWhat are SDN Northbound APIs (and SDN Rest APIs)?What is Software-Defined Security for SDN?How Does ETSI NFV Operate? What is an NFV Orchestration? What’s in an NFV Cloud? What is a Virtual Network Function or VNF?